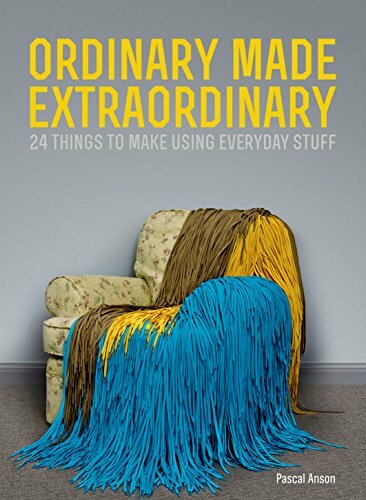 [PDF] Ordinary Made Extraordinary: 24 Things to Make Using Everyday Stuff | Free eBooks Download - EBOOKEE! Description: International designer, artist and blogger Pascal Anson shows us how everyday items, junk and interiors can be reinvented. He teaches readers to create a splendid chandelier with just a few rolls of Sellotape, cast a stunning planted pot worthy of any designer homeware store using a cheap bag of concrete mix and a recycled plastic food tub, and build a childâ€™s dream treehouse with nothing more than everyday cling film. There are ideas for projects for everyone, from the four-minute makeover skinny jeans, to repairing and reinventing worn out trainers, to bigger projects such as the wood-clad car and the stylish hairy chair. No comments for "[PDF] Ordinary Made Extraordinary: 24 Things to Make Using Everyday Stuff".